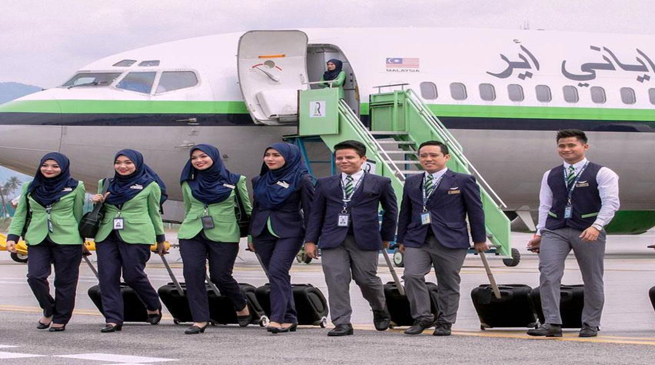 Malaysia’s first Sharia-compliant airline Rayani Airlines, launched flights following the tenets of Islamic law that ban alcohol, allow only halal foodstuffs, and require women to cover their hair. Rayani Air’s first service, from the capital Kuala Lumpur to Langkawi, a popular holiday destination, followed rules the company will adopt on all flights, which will see prayers recited before take-off, a ban on in-flight alcohol, and Muslim air stewardesses obliged to wear the hijab, the Islamic headscarf. Malaysia is about 60 per cent Muslim, with other popular religions including Buddhism and Christianity. Sharia law is based on readings of the Koran and the sayings of the Prophet Mohammed, and is supplemented by later interpretations. Halal – meaning “permissible” in Arabic – is a standard applied to foodstuffs, drinks and cosmetics that are prepared in line with methods to make them acceptable under Islamic law. It bans pork products and by-products such as gelatine, as well as alcohol, which is deemed “haram” (forbidden). Airlines operating from Saudia Arabia and Iran already adhere to Sharia principles. Women on Iran’s national airline, Iran Air, must wear the hijab at all times on board, while Saudia, Saudi Arabia’s flag carrier, does not serve alcohol and bans passengers from bringing it on board. A UK-based Sharia-compliant flight company is also planning to launch in 2016. Firnas Airways, plans to launch its first route to Sylhet in Bangladesh, with more services to Jeddah in Saudi Arabia, New York, Pakistan and Iran planned. It claims to offer, “a full premium service at economy budget”.